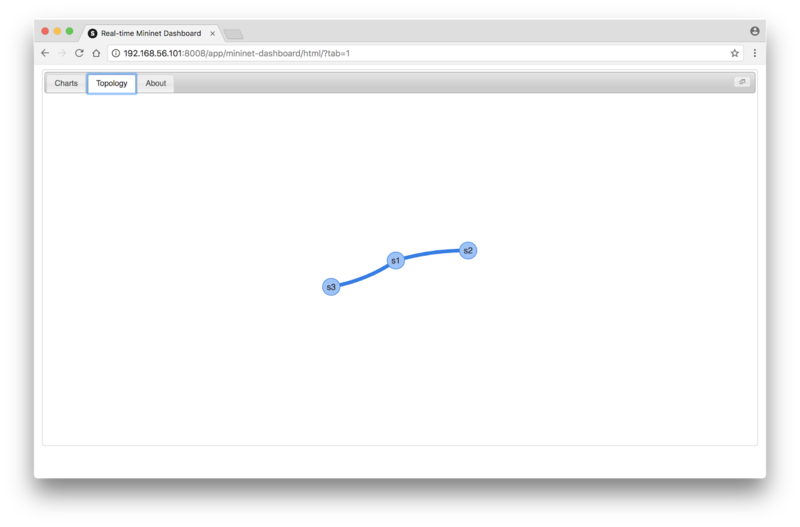 ONOS traffic analytics describes how to run the ONOS SDN controller with a virtual network created using Mininet. The article also showed how to monitor network traffic using industry standard sFlow instrumentation available in Mininet and in physical switches. This article uses the same ONOS / Mininet test bed to demonstrate how sFlow-RT real-time flow analytics can be used to push controls to the network through the ONOS REST API. Leaf and spine traffic engineering using segment routing and SDN used real-time flow analytics to load balance an ONOS controlled physical network. 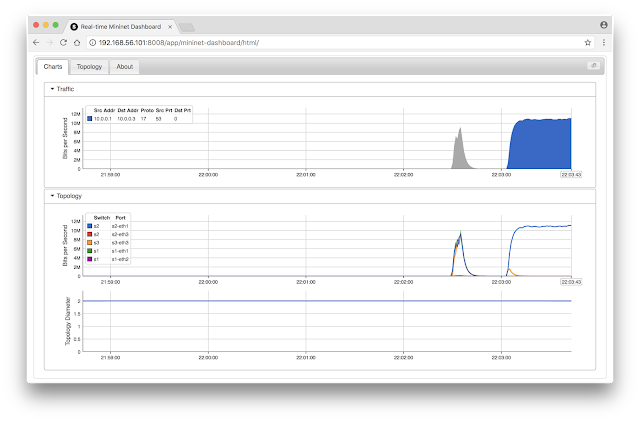 In this example, we will use ONOS to filter DDoS attack traffic on a Mininet virtual network. The ONOS REST API is used to add/remove filters that block the DDoS traffic. The controller address, 192.168.123.1, can be found on the ONOS Cluster Nodes web page. For simplicity, this script is missing the error handling needed for production use. See Writing Applications for more information. The weathermap view above shows the flow crossing the network from switch s2 to s3 via s1. The weathermap view verifies that the attack has been successfully blocked since none of the traffic is seen traversing the network. The chart at the top of this article shows the iperf test followed by the simulated attack. The top chart shows the top flows entering the network, showing the DNS amplification attack traffic in blue. The middle chart shows traffic broken out by switch port. Here, the blue line shows the attack traffic arriving at switch s2 port s2-eth1 while the orange line shows that only a small amount of traffic is forwarded to switch s3 port s3-eth3 before the attack is blocked at switch s2 by the controller. 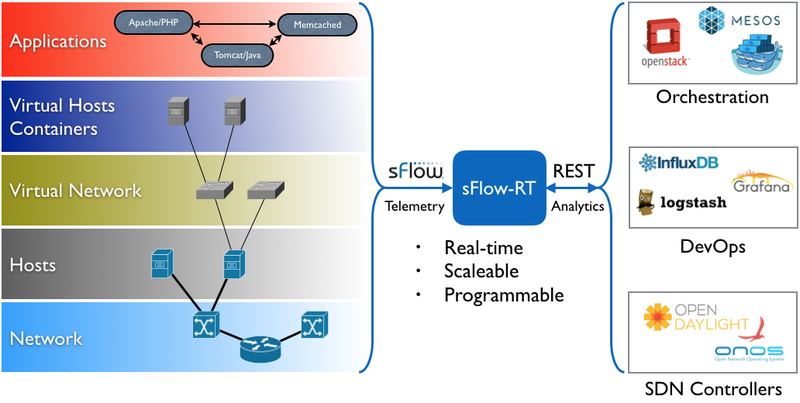 Mininet with ONOS and sFlow-RT is a great way to rapidly develop and test SDN applications, avoiding the time and expense involved in setting up a physical network. The application is easily moved from the Mininet virtual network to a physical network since it is based on the same industry standard sFlow telemetry generated by physical switches. In this case, using commodity switch hardware to cost effectively detect and filter massive (100's of Gbit/s) DDoS attacks. When I run the code ddos.js in the sfow-rt directory I get this error. hello peter. is there any algorithm detection and migitation that will work with sflow on ipv6 sdn network. You could easily modify the script in this article for IPv6 DDoS attacks. Change ipsource to ip6source in the flow definition and modify the OpenFlow rule to filter on IPV6_DST instead of IPV4_DST. can anybody help me how to perform "DNS amplification attack in mininet"
The hping3 command in this article is an example of simulating a DNS amplification using the DNS protocol (UDP port 53). See DNS amplification attacks for more information. it this article work to mitigate ddos attack in opendaylight controller?? ?